Composed by Various. Arranged by Marion Maby. Romantic Period, Classical Period, Baroque Period, Wedding. Score. 27 pages. Published by M. Maby, arr. (S0.76817). 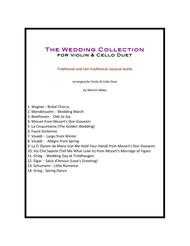 When you're tired of the Pachelbel Canon, reach for this collection. 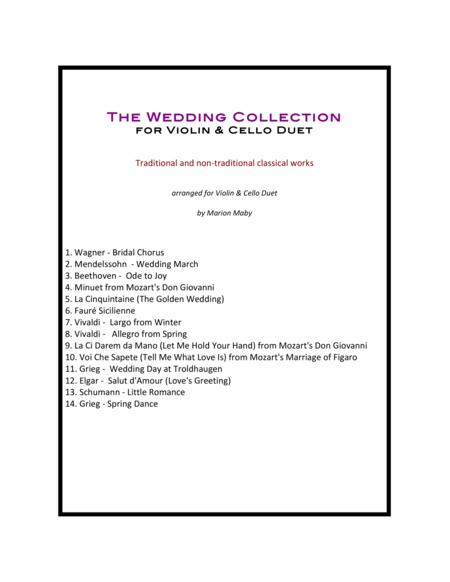 Here are a few traditional, but more lesser heard classical works appropriate for weddings. The traditional Wagner and Mendelssohn marches and Beethoven's Ode to Joy in fresh arrangements but also many others, such as Grieg's joyful Wedding Day at Troldhaugen, Elgar's Salut d'Amour, Faure's lilting Sicilienne, La ci darem la mano (Let Me Hold your hand) from Mozart's Don Giovanni, Schumann's Little Romance, Vivaldi's Spring and several others -- all with equal parts for violin and cello in full-sounding, musically intriguing arrangements. .